The event will take place on the Opinmäki campus in Suurpelto, Espoo on 7-9 June. 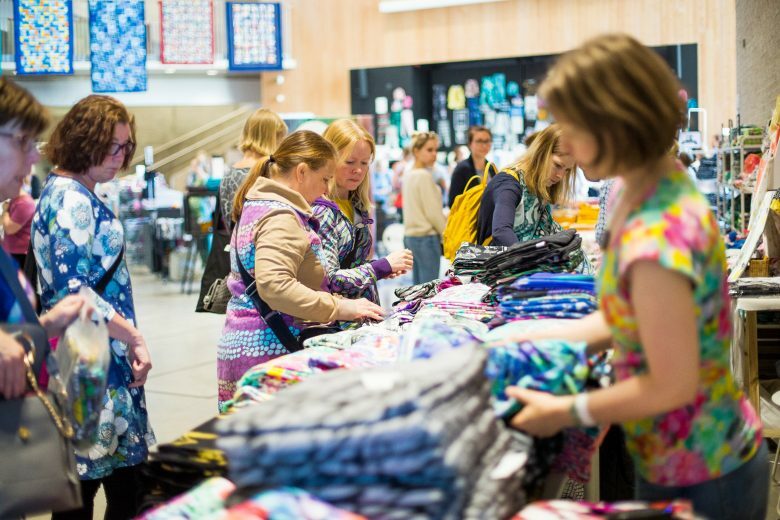 Ommel 2019 is a sewing festival with a strong communal aspect for all sewists from beginners to professionals. The event combines a fabric and sewing supply market, a three-day sewing retreat, and educational contents such as courses, lectures, and workshops. Ommel 2018’s theme was Finnish design and this second time the theme will be Nordic design. We are inviting all fabric sellers from the Nordic countries and visitors from all over the world to come join us. Besides just fantastic fabric, all kinds of material and notions from threads to sewing machines and magazines will be for sale. A good selection of just sewing products and activities. Other craft fairs include so many other techniques but here you could concentrate on just sewing. Entry to our festival is free! Workshops and lectures are also free and you don’t have to sign up for them in advance. The sewing retreat, courses and accommodation in the school are paid, and you can book your place on this site closer to the event. Ommel 2018 was the first time the festival was organised and 3000 people attended. We received lots of positive feedback which will allow us to make Ommel 2019 even bigger when it comes to sellers, activities and visitors. The event is held on Opinmäki campus in Suurpelto, Espoo. Since we have a limited number of parking spots, we request that as many visitors as possible will arrive by public transport or that you carpool with others. Entrance to the event is free of charge! Workshops and lectures are also free and you don’t have to sign up in advance for them. The sewing retreat, courses and accommodation at the school are booked and paid in advance. Sewing retreat: The sewing retreat is a communal event where everyone brings their own sewing machines, fabrics and other equipment, and sews together with others. At the retreat everyone is sewing separately but together – everyone has their own projects and plans. The sewing retreat is open from 12:00 to 01:00 on Friday, 10:00 to 01:00 on Saturday and 10:00 to 18:00 on Sunday. Book your place! Workshops: To be announced in April. Lectures: To be announced in April. Do you need accommodation in Espoo and would you like to spend the weekend with other sewists? We offer affordable accommodation at the festival site in Opinmäki. We recommend staying at the school especially if you take part in the sewing retreat. The price includes a floor spot in a classroom. We also offer an affordable breakfast and evening snack. Bring your sleeping mat and sleeping bag. One night’ accommodation costs 20 euros and breakfast and evening snack cost 10 euros. Forenom offers accommodation at a 10% discount to Ommel visitors. Stay at the Forenom Aparthotel in Leppävaara, Espoo (Porarinkatu 1A, Espoo). The prices start from 55€ per night. Use the code OMMEL2019 to get the discount. Take a look at the hotel and book your accommodation here.